In part1 (Part 1: A Parable about Uncertainty and Risk – Playing with a visual Metaphor) I introduced a visual metaphor to think about how uncertainty and risk (U&r) into our lives. I left off this post with two questions:1. Does our learned from experience (LFR) cone always continue to expand until our death? Why, why not? Does our learned from experience (LFE) cone always continue to expand until our death? Why, why not? Why do I abbreviate uncertainty and risk as U&r? Let us deal with the second question first: I hold the view that we live in a universe that is more uncertainty like than risk like. Why? The future is unclear and by all ours (and others) history likely full of surprises. Even that which we have some inclination about we do not understand it very well. Well enough to deal with it effectively. Even if we know others have such knowledge, we often face obstacles in being able to make use of it. We forget, we ignore, we fail to process the meaning or significance of what we have experienced. Risk is about what we have experienced, understand, and have practical ideas on how to handle when we face equivalent re-occurances of such events. Our senses take in much more than we can possibly process. For example we hear many things but are only able to pay attention to a few sounds. This is a blessing in that we can focus on what we see as important. We sometimes learn later that we could have picked up on something said that was subsequently significant, fortunately by someone else who was at the scene. Without them we would never have been aware that there was more to be learned. Our views and mental models on what is important mean we are selective in what we pay attention to. Different models and mindsets would have paid attention to differing data and hence made differing sense of. In Part 1 I noted the role of biases in reducing our capacity to process and incorporate contrary data. We are just not everywhere at any time. Something important may be just out of our range to be even able to know about. Because of our individual limits on understanding what we are witness to let alone what we aren’t, we can make the argument that socializing is one of humankind’s greatest inventions or attributes. We can, if we so choose (yes there is a choice to be made) to take advantage of what others have experienced and learned from and make use of it. We can take advantage of someone else’s learning. Deliberately seeking those with diverse (from our own) experiences and learning potentially opens up our capacity to make experiences more risk like and less uncertain like. This is a wonderful gift. The matter of using others’ LFE is one of trust and believability. for example, someone may tell me that they have experienced an alien abduction. But it is not unreasonable for myself and many others to be skeptical. Sometimes it is important to establish some form of verification of another’s LFE claims, especially if a lot is riding on the claim. There are many situations where there is skepticism based on factors other than knowledge about the subject matter of the claim itself. There are many people who do not trust anything coming out of large pharmaceutical companies because they are in the business of making money. The “bearer” of the LFE claims has a bearing on the trustworthiness of what is claimed. The useful can be discounted, the un-useful can be taken as gospel. Trustworthiness is a foundation in any social setting. BUT, trust is not just about the affirming positive. I can trust that you will have my best interests in mind, OR, I can trust that your interests are inimical to mine. Trust at its heart is about predictability and consistency. Over the years I have learned to work and associate very successfully with people who I have a clear understanding of the limits of their likelihood to be on the same page as me so to speak. For example, knowing to avoid certain topics (politics, religion, etc.) with some others is absolutely critical if you are going to be productive with them. 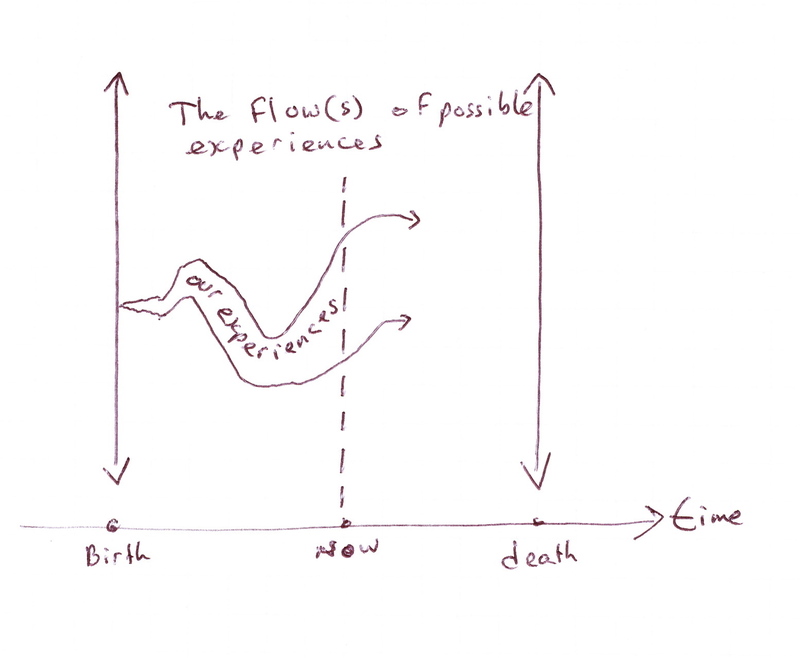 Does our experience and LFE continue to expand until our death? I have met numerous people over time who at some point in their lives choose to lead a “constraining” life style. These are people who choose to not seek new or novel experiences. Reasons can be very understandable: illness, loss of some functionality or other, or even clear preferences on how they want to live. So the experiences growth in terms of new, novel, diverse, etc. can cease. But what about LFE? LFE requires the work of being inquisitive and thinking. Both a lot of work. Also being inquisitive can be quite expensive (travel, studying, taking in new experiences, etc.). Again, I would suggest that we can stop growing here. We can forget. We can lose proficiency with lessons that need to be practiced if they are remain useful. Illness and mental health can reduce the ongoing LFE. 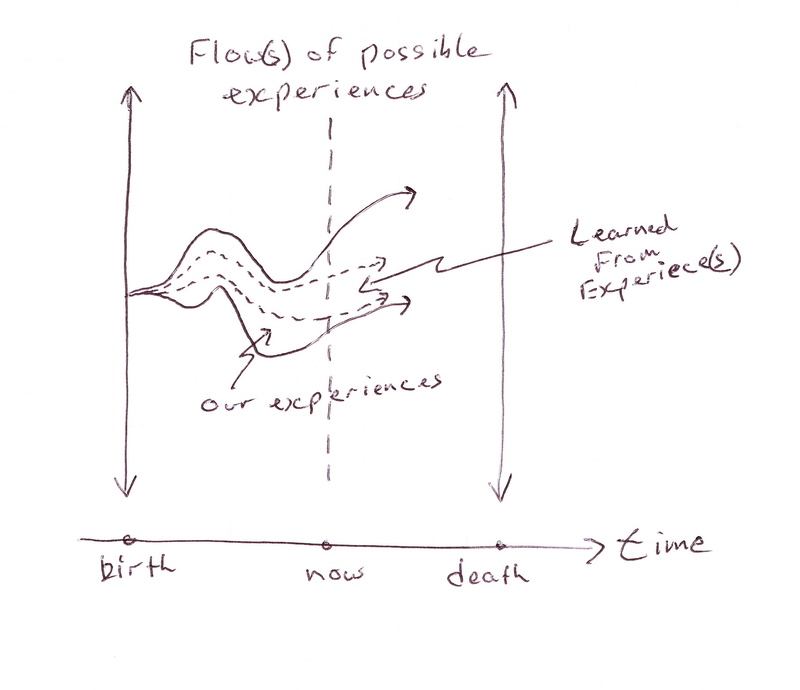 So my visual model entails the possibility that both the ongoing growth in experiences and LFEs can crease and in some ways regress. Can we see similar patterns in organizations? Yes I think we can. Organizations (the people within them) can become insular. Successful organizations in particular are more exposed to hubris and insularity. In other situations, some organizations who believe they have the “truth” about something will act with even with viciousness to any evidence or suggestion that there might be a “better” (sic) truth. The notion of heresy is an outcome of these insularities. Any bias that is immune to correction or change due to new evidence (i.e., addition LFE) is going to have a predisposition to close down open inquiry (an act to expand experiences) and discourse (processing for new LFE). Every organization has an operating model. This is a jargon term that simply means that the organization has a specific idea on how to succeed as a business. The strategy activity in the organization is the means by which it shifts and moves its way of operating moving forward in time. Many assumptions are made along the way (in doing strategic change and even in an operating mode). Assumptions by definition are are selective of some things over almost an infinite number of other things. Who should be our customers (or not), how should we invest and run so we are competitive (or not), how best to gather our inputs resources including people (or not), how best to socialize so our people can be effective and efficient (or not). The “or not” are sometimes more important than the “to be” as we are defining ourselves as much by what we are not as well as what we are. What I find intriguing is that i have read and heard reports that some organizations have an almost antagonistic attitude towards strategy. If this true then I would argue that these are organizations that have no systematic LFE process for itself as an entity. This is almost like intentionally having no intended coherent approach to personally growing. Without intention, we still change, but only in a reactive and delayed way. Only by doing meaningful strategy can we do more than react or after the fact. If we can make the assumption that our operating/living environments are going to continue much as they are, it is relatively safe to not grow our LFE. If we are successful now, we will likely continue to be so. This stability assumption requires us to believe that there is no uncertainty in our environment(s). This is an assumption that I will personally never make, nor want to entrust any meaningful aspect of my life in with someone who holds this assumption. I certainly would not want my retirement investments located there. This entry was posted in Creativity, Decison Making, Performance Management, Risk & Uncertainty, Strategy, Values. Bookmark the permalink.